This Hadith has been collected by Muslim, at-Tirmidhee, Ahmad, and other than them from the scholars of hadeeth, and it has been declared authentic by Al-Albaanee. In a narration, he (ﷺ) said: “Those who rectify themselves [and others] when the people have become corrupt.” Reported by Ahmad and At-Tabaraanee. These narrations, may Allah bless you, describe a group of individuals who are “ghurabaa”. 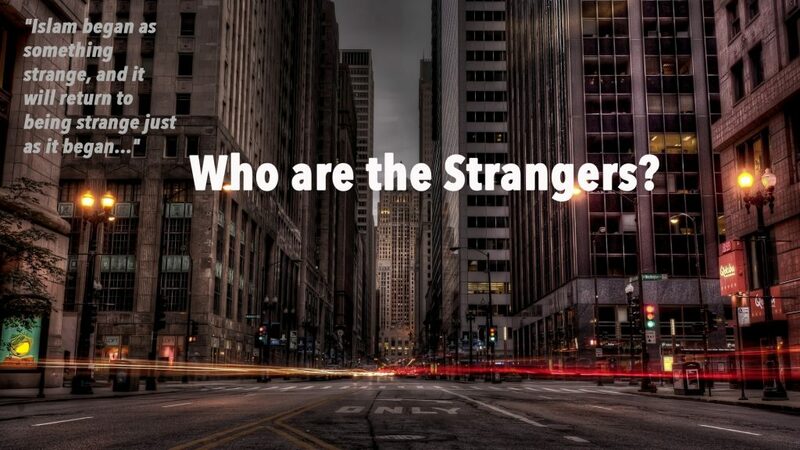 They are “the strangers”. So the Messenger of Allaah (ﷺ) has informed us in this hadith that indeed Islaam began as something strange, and this is because when the Messenger of Allaah (ﷺ) began the call to Islaam, the call to the worship of Allaah alone (the Most High) in Makkah, then only a few followed him, and they were truly “ghurabaa”. They were truly strangers in their beliefs, in their mannerisms, their ways and in their appearance. They were the strangers in a society that was filled with ignorance (Jaahiliyyah). They were a group that were few in number, nevertheless they were the people of truth (ahlul-haqq). These are the Ghurabaa, may Allaah bless you, guided by Allaah (the Most High) adhering to the Truth and the Sunnah. They are those that are guided by Allaah and they guide others. Allaah guides through them other individuals, and by way of them Allaah gives life to the Sunnah. May Allaah (the One free of all imperfections) make us from amongst them. Imaam Al-Barbahaaree (d. 329H) likewise said, “That truth or haqq is that which comes from Allaah and that which is in the Sunnah, the Sunnah of Allaah’s Messenger (ﷺ), and that which is from the Jamaa’ah – and the Jamaa’ah is what the Companions were united upon during the khilaafah of Abu Bakr, ‘Umar and Uthmaan (M).” This is the Jamaa’ah, and whosoever follows their way, then he is the Jamaa’ah, whether there are few in number, or whether they are large in number! Islaam began as something ghareeb (strange), something that was strange to the people, strange in their worship, strange in that which they called to. The Prophet (ﷺ) and the Sahaabah (radiyallaahu ‘anhum) were living in an ocean of people that were committing all types of obscenities, shirk, and heresy, such that the Prophet (ﷺ) said in an authentic narration, “Allaah looked upon all the people of the earth, Arab and non-Arab, and despised all of them, except for some remnants of the People of the Book, (meaning the Jews and the Christians). He said: I sent you (O Prophet) to test you, and to test others by way of you. And I have revealed to you a Book that cannot be washed away with water.” (Muslim) These People of the Book followed that which Moosaa (peace be upon him) or ‘Eesaa (peace be upon him) left them upon of tawheed and belief. So Allaah (the Most High) despised them all because of the polytheism they were upon, because of the depravity that they were upon in terms of their behaviour and their conduct, their idolatry and their killing and their murder, their separation and their hatred for one another. Then Allaah from His Mercy sent the Messenger, Muhammad (ﷺ). They were in a society, may Allaah bless you, that was filled with misguidance: deviation with regard to their belief and their creed and moral conduct. So when the Sahaabah were guided by the Revelation sent to Muhammad (ﷺ) just as Allaah willed, there appeared a group of people who were different, they went against the grain, they went against that which the majority of the people were upon. Not because of violence, because there was no violence in Makkah perpetrated by the Sahaabah (rather they were the victims of violence and terror). The Sahaabah (radiyallaahu ‘anhum) in Makkah were not commanded to raise the sword; they were strange, they were different, and thus they were oppressed due to that and due to their belief. This matter that they brought was strange to the people, they would say: These many gods that you worship, all of them are false deities, worship only One God, and He is Allaah the Creator of the Heavens and the Earth. They found that strange, and they found that to be something that they could not tolerate, so they persecuted, tortured and opposed them. They spoke against them and they lied against those righteous believers, the Companions of the Messenger (ﷺ). The point here being is that the Prophet (ﷺ) said, “Islaam will return as something strange”, just as it was in those times. Just as it began in the first place. So you can imagine the Sahaabah (radiyallaahu ‘anhum), how they were in their time, and how they would have been perceived and how they would have been looked upon – and how Muhammad (ﷺ) would have been perceived through the eyes of the idolators, the people of Quraysh and his tribesmen. Thus, Islaam will return and be looked upon just as it was looked upon then: “just as it was in the beginning”. Islaam will return to being strange towards the end of time just as it was something strange at the beginning, when Muhammad (ﷺ) received revelation. This is the reality: when the strangeness comes back it is not because the Muslims will be few in number, this is not what is intended as you find from the end part of the hadith. Rather, the Muslims will be great in number, but the strangeness is in that which they carry of belief and methodology, that which they call to, that which they are upon of solidity, firmness and steadfastness just as the Prophet Muhammad (ﷺ) was in the face of all the opposition, the hatred and the boycotting. So, this is not due to their scarcity in number rather it is due to the small number of Ahlus-Sunnah wal-Jamaa’ah, not the small number of Muslims, meaning, amongst this huge body of Muslims there will be strangers. They are the Ghurabaa – and that is because those strangers amongst the ranks of the Muslims will be small in number, Ahlus-Sunnah will be scarce, those who truly follow the way of the Prophet (sallallaahu ‘alayhi wasallam) will be miniscule compared to the opposers. They are upon the correct understanding of Islaam, that which the Sahaabah, the Companions were upon, they are the Ghurabaa amongst those people that will be great in number – they are righteous people amongst the large body of wicked people. This is Ahlus-Sunnah wal-Jamaa’ah, the Salafis. Wickedness here is explained as bid’ah, opposition to the obedience of Allaah and His Messenger (ﷺ), and heresy and opposition to the Revelation, that which Muhammad (ﷺ) was sent with, and that which his disciples, the Sahaabah (radiyallaahu ‘anhum) were upon. The people sorrounding the Ghurabaa (Ahlus-Sunnah) follow their desires, they will hold opinions and viewpoints in opposition to that which the Prophet (sallallaahu ‘alayhi wasallam) came with. They will rule and judge their affairs by their desires, and they will live their lives in accordance to those desires; they will follow heresies and innovations according to their opinions opposing that which Allaah the Lord of the Heavens and the Earth revealed to them. So these people lead themselves astray, and they lead others astray. The Ghurabaa, may Allaah bless you, are the Scholars and those who follow them. The Prophet (ﷺ) mentioned their reward, “Tooba is for the Strangers”. And the Prophet (sﷺ) mentioned in the hadith which is authentic upon him, that Tooba refers to Jannah, and it is said that it is a tree in Jannah as occurs in a hadith that is authentic that there is a tree in Jannah by the name of Tooba, and its trunk is made of gold. So “Tooba is for the Strangers” meaning: glad tidings of Jannah and the trees of Jannah for those who are the strangers, those who rectify the affairs when the people have made them corrupt. They are, as occurs in a narration, when the Prophet (sallallaahu ‘alayhi wasallam) was asked: “Who are the Strangers?” He (ﷺ) said: “They are [small] numbers extracted from the various nations and tribes.” Who are the Ghurabaa? The Ghurabaa are not isolated to one race, one continent, one nation or one tribe. The Ghurabaa gather one here, two there, a few here and there; these are the Ghurabaa, plucked from the people. So these are the Ghurabaa, they are the ones who hold fast to the Religion of Allaah, the Most High, in times of strangeness and he (ﷺ) specified glad tidings of Paradise for the Strangers due to their tremendous patience in holding to the truth, especially in later times before the hour is established. That is because the one who holds to the truth, in times when Islaam and the Sunnah, the way of the Sahaabah, has become scarce, has become difficult, has become strange, is like the one who is holding onto hot coals. How would you be my brothers and sisters, if I were to say to you put out your hand, and you see me with tongs holding a glowing hot coal, and I say to you “put out your hand, and don’t move it as I place the red hot coal onto it.” How long will you keep your hand in place? Will you take grasp of that red hot ember? Would you hold onto it if you knew that by holding onto it that you will be from those who are saved? For indeed the Messenger of Allaah (ﷺ) said in a hadith narrated by the Companion, Abu Tha’labah al-Khushanee (radiyallaahu ‘anhu) that the Messenger of Allaah (ﷺ) said, “Ahead of you are days of patience, and having patience in that time is like holding onto hot coals,” and whomsoever holds onto the Religion in the times of fitnah and difficulty there is an immense reward – in times when the innovators are calling you away from the Sunnah, calling you to heresy and misguidance and innovation: whether it be from the direction of the Khawaarij insurgent terrorists, the Iranian-backed Raafidah, the rebellious political agitators, the Soofees, the grave-worshippers, the Ash’arees, the Qutubees, the Tableeghees or Ikhwaanees. In times of fitnah holding onto the Deen is extremely important – and not being deceived by the opposers (the Mukhaalifeen), and not being beguiled by them because of their large numbers – the Ghurabaa are not large in number, and that’s why this hadith is there, to give heart and courage to the Ghurabaa; to give you that enthusiasm so you do not lose hope and you do not lose heart. Allaah, the Mighty and Majestic, aids the believers, even if they are few in number, and the Ghurabaa they are indeed few, and they are ahlus-Sunnah in truth. The term Ghurabaa has been used by ahlul-Bid’ah and the Khawaarij in these times yet they are least deserving of the title and they are the furthest from fulfilling its true description – how can those who raise the sword against the Muslim rulers and spill the blood of innocents be referred to as Ghurabaa!? Islam did not come with this foul conduct that they ascribe to it – and all praise is due to Allah. In reference to the times of hardship that were to come the Prophet (ﷺ) stated, “Ahead of you are days of patience, when holding onto the religion will be like holding onto hot coals, and whomsoever holds onto His religion in that time, then his reward will be the reward of fifty men.” The Companions said, “O Messenger of Allaah, fifty times the worth of their reward?” He said, “Rather fifty from you.” Collected by Abu Dawood, At-Tirmidhee, Ibn Maajah, Al-Haakim who declared it authentic, Adh-Dhahabee agreed and Al-Albaanee declared it Saheeh in As-Saheehah (no. 494). This is the reward of holding onto the religion in times of fitnah, when the misguided callers stand and call to the gates of Jahannam just as the Prophet (ﷺ) said, “There will be du’aat (callers) at the gates of Jahannam. Whoever responds to them, they will cast them into it.” (Bukhaaree and Muslim). They call to misguidance, deviation and bid’ah – and to the innovated sects, groups and parties. Why? Because they stand at the gates of the Hellfire such that you can’t even envision the Hellfire behind them. May Allaah protect us and keep us safe from that. Do not be afraid of the people such that you stop practising, or you stop speaking. The fear of the people should not stop you from speaking the truth. Ahlul-Haqq and the people who know the truth and act upon the truth, they are not afraid of holding onto the truth and conveying it. Even in these months that are in front of us now, and you will come to see when the conference season comes, the holidays come, you will see ahlul-bid’ah gathering the people in their conferences and mosques, the Hizbies (sectarian partisans) that gather the people. You will see the odd one and two even from those of you sitting here today, that you will be deceived by them or you will pretend that there is good in them and you will go to them, because this is the nature of people. Allaah (the Most High) does not give steadfastness except to those whom He loves and wishes good for, those who follow the footsteps of the Prophets (‘alaihimus-salaam). Allaah’s Messenger (ﷺ) said, “Those that are tried the most are the Prophets, then those who resemble them, then those who resemble them.” The Prophets remained steadfast, and those who resemble them are steadfast, and because of their steadfastness they are tried and they are put to trial, and their life is difficult and hard, but they do not leave the obedience of Allaah. They do not give in neither to the doubts of bid’ah, and nor to the desries of sin. Those of you who give in easily to the sins that call you, and those of you that give in to the doubts that are thrown at you, then both of you are upon a path of weakness which will only lead to your own destruction. So take heed, may Allaah bless you. Thus, we have been commanded to enjoin the good and forbid the evil, and we do not care about numbers. What is going to happen on the Day of Resurrection? The Prophet (ﷺ) said in a hadith, “The nations were presented before me, I saw a Prophet, and I saw that he did not have except a handful of followers and I saw a Prophet and he had one follower, and I saw a Prophet and he had no followers.” (Bukhaaree and Muslim) He (ﷺ) informed us that a Prophet would come forth on the Day of Judgment, and he was sent by Allaah to call his people to the worship of Allaah, and who listened to him? One man listened to him. Nobody else, no one else listened. A Prophet of Allaah, a Prophet will come on the Day of Judgment and he will have but two people with him! Does that affect the truth that they were upon? Does that change that they were upon the truth because you look at how many people were following him? Free is Allaah from all imperfections! The truth is not measured by numbers, “The Jamaa’ah is whatever is in accordance to the truth, even if you are on your own” as Ibn Mas’ood stated. The Jamaa’ah is the people of truth, who follow the Qur’aan, who follow the Sunnah, who follow the Sahaabah. We care notfor the rabble that gather around Ahlul-bid’ah in their conferences and their gatherings. So as I said before, go if you wish to go, we are here. And we will remain here with Allaah’s permission holding fast to way of the Salafus-Saalih. Ahlus-Sunnah wal-Jamaa’ah do not alter with time, they are upon the Sunnah in every age, in every time. A Prophet will come on the Day of Resurrection and he will have no one behind him, no body listened to him, maybe they even killed him. As occurred with the Prophets of the Children of Israa’eel, the likes of Zakariyyah and Yahyaa and other than them (‘alaihimus-salaam). Prophets that were chased, Prophets that were beheaded and Prophets that were tortured and killed. And there were Prophets against whom attempts were made to kill them like our Messenger Muhammad (ﷺ). Did these Prophets change? Did they alter? Did they concede? It does not matter, numbers do not matter my brothers and sisters, what is important is that you hold fast to the truth. And that truth, may Allaah bless you, does not alter, and the Ghurabaa they will remain in every age, in every era, and they will remain strong. For this reason you find the scholars when they mention the Ghurabaa, they say the Ghurabaa are one group – the Prophet (sallallaahu ‘alayhi wasallam) said, “There will never cease to remain a group from my Ummah manifestly upon the truth, unharmed by those who oppose them or forsake them.” Meaning this singular group will remain, from my nation, they will remain upon the truth manifest and aided, and that is the Saved Sect (Al-Firqat An-Naajiyah). And this group remains in every era, every age up until the decent of ‘Eesaa Ibn Maryam (‘alaihis-salaam) or up until the Hour as occurs in some narrations. Imaam At-Tirmidhee said about the Aided Group (At-Taa’ifah Al-Mansoorah): “They are the people of knowledge and the people of narrations.” They are the Jamaa’ah, may Allaah bless you. As occurred with the conferences of ahlul-bid’ah and the hizbiyyeen where a few of the brothers fell into confusion, and some of you, not many (alhamdulillaah) went. Most of the people here, they know. But some of you went and you were deceived, and they deceived you, and you fell into the traps of hizbiyyah, so this year do not be deceived, stand firm, stand strong, stand upon the Sunnah. Be like ‘Abdul-‘Aziz Ibn Baaz, Muhammad Ibn Saalih Al-Uthaymeen, Muhammad Nasirud-Deen al-Albaanee, Muqbil Ibn Haadee, and be like Rabee’ al-Madkhalee, Saalih al-Fawzaan, ‘Ubaid al-Jaabiree – no matter what happens to the environment around them, they are still upon the methodology (manhaj) of the Salaf. Remain steadfast my brothers and do not be deceived, do not be deceived by those who seek to deceive Ahlus-Sunnah. May Allaah, the Mighty and Majestic, keep us steadfast, upon the Sunnah up until we meet Him. And all praise is due to Allaah, the Lord of the worlds and may the peace and blessings of Allaah be upon the Prophet, his Companions and followers. Lecture by Abu Khadeejah Abdul-Waahid, transcribed by Umm Abdillaah Al-Albaaniyyah – Adapted for easier and comprehensive reading. SubhaanAllaah..JazaakAllaahu Khayran for this excellent article..
A must read ..this article brings tranquility to the heart and contains an encouragement to remain firm upon the truth and with its people..may Allaah preserve you Ustaadh.